last Saturday and so I decided to go on Sunday instead to see for the first time the "Revenge of the Fallen" figures. 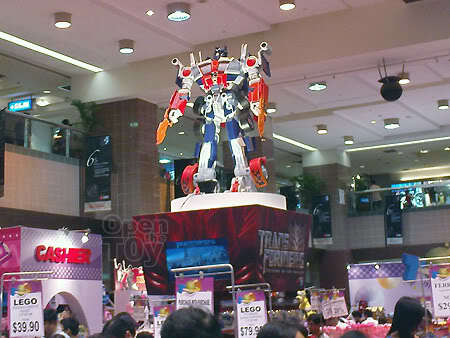 I head down to Toys 'R Us at Forum Mall Singapore where the event took place the day before. I was pleased to see the attractive decorations that Toys 'R Us had put up. Indeed I started to feel the mood of the movie already. The trailer was playing at the entrance plastered with giant transformers wallpapers. The Transformers movie toys were stacked up at the entrance and one day after the event, I can take my time to slowly take a good look at the toys. 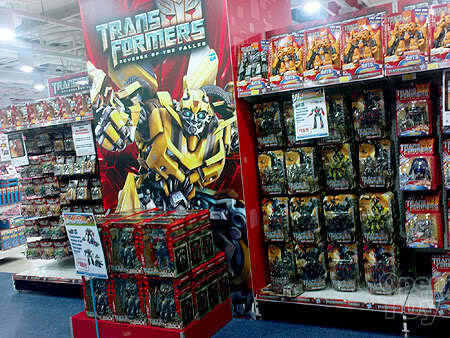 The full range of the Transformers toys were all well-stocked. 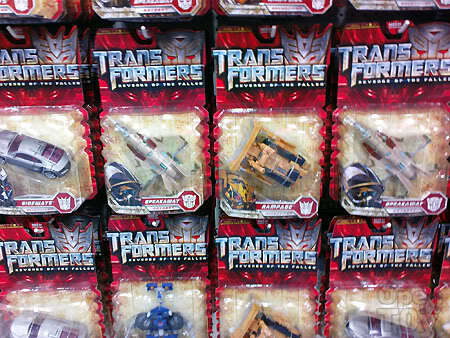 Most of the figures such as Leader class Optimus Prime and Megatron were still available. 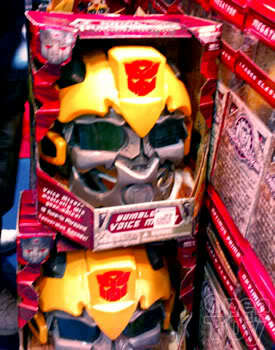 It's not surprising as the price tag of the toys were well above S$100 SGD. With current economy, people are really thinking twice before grabbing one and Hasbro have tagged these new movie toys higher than the previous one despite the bad economy. Who knows they may have a Premium version coming later? That I learned from the previous movie figures and it would be cheaper during the cooling period. There are however some figures I did not see at Toys 'R Us that day. Deluxe Sideswipe was missing from the rack. Due to the sleek design of the concept car design, it was a sell out among the fans and all I see on the rack that day was the following. Most of the voyage Class can be found except for "The Fallen". I'm not sure is it out but I didn't see it that day anywhere. 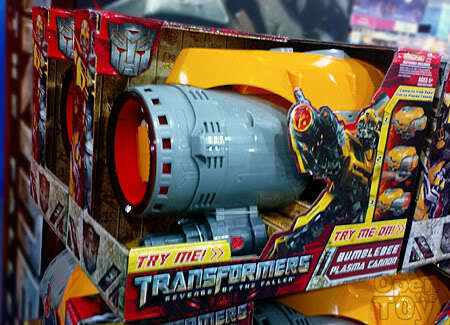 In Toys 'R Us that day, one of the toys that interest me in the coming movie toys is not a transformers vehicle toy but BumbleBee Plasma Cannon Gun. I will surely love this piece of cool cannon hand gun if I was a kid...Heck! Even though I am not a kid I'm already falling in love with this baby! This toy comes in two modes, Punch or Cannon. In Cannon mode, when you squeeze the trigger, the cannon will simulate a cool recoil together with a cannon sound effect. I can foresee this baby flying off the shelves real soon. You can read more of the details of Bumblebee Plasma Cannon gun here. After looking around Forum Mall Toys 'R Us, I head down to Takashimaya as I heard there is a toy fair at the basement lobby. 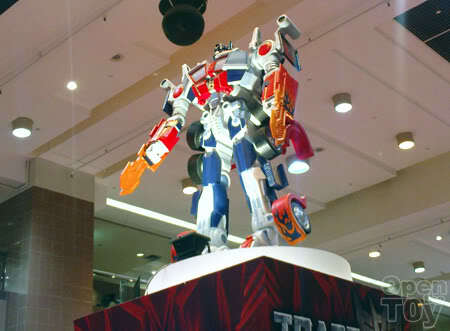 When I reached the basement, I saw a big Optimus Prime figure in the center of the lobby. How big is this Optimus Prime from the latest transformers movie? It is about 1.8 meter in height and at closer look, it still a very nice piece of work. No that is not a toy for sure. Just an advertising figure. Nice work Hasbro! By the way, I saw some Deluxe Sideswipe at Takashimaya but I didn't purchase anything that day. I'm still focusing on the Animated series. Hehehe So that wraps up my weekend sighting for the Transformers: Revenge of the fallen. Autobot, Transform and Roll out! Thx for the intel bro! You are very discipline not to buy anything. Cheers! Yes they are pretty well stocked for leader class. Juliana, I didn't watch it that day but I saw that same performance way back last year. I happen to blog about that too. And yes they did transform from vehicle to robot mode in the beginning of the show. Who else do you need to complete your TFA collection? Are you collecting all of them? Jcee some of our toyRus are quite messy too. 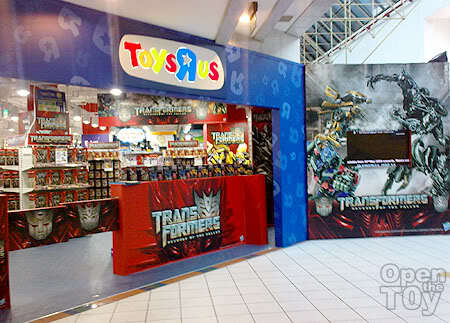 It just that toyRus at forum mall are way out of place thus hardly a lot of kids and parent go there. I like Deluxe Sideswipe a lot due to its vehicle model and design..Heard it's a concept car..